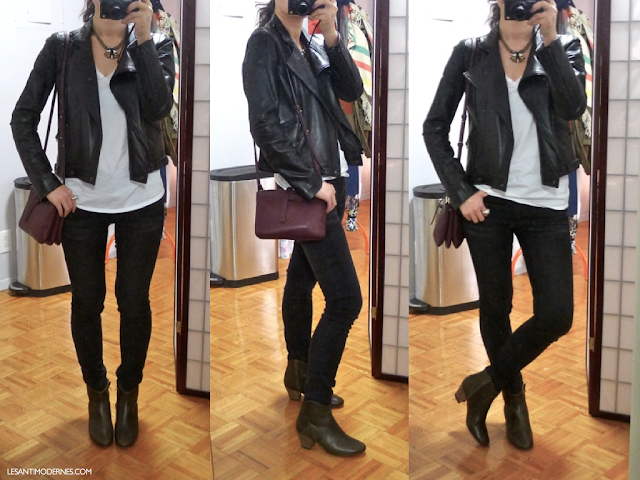 this NYE, our plans were relatively low-key – simple but delicious dinner at home, then a friend's house party...so it felt appropriate to celebrate the start of 2014 with wardrobe foundations and longtime favorites: my beloved rag & bone biker jacket (similar here and here) paired with one of my essential white tees, favorite black skinnies, and the new-ish second pair of isabel marant dicker boots i got a few months ago (the most comfortable shoes to wear to a standing-room-only apartment party!). a j.crew necklace (similar here) and a fun iosselliani cocktail ring added a bit of festive sparkle, and all the evening essentials fit nicely with room to spare in my new burgundy trio bag. a harmonious mix of the old and new. i hope you all had a merry new year's eve. what did you wear? Great outfit, love the simplicity! I'm also a big fan of the everlane t-shirts. I am loving the leather jackets you've been linking to lately and I think one of these, or something like it, will be on my shopping list for 2014. Would love ideas for under $1,000 if you have any -- am willing to spend on this but was thinking more in the ballpark of $800 or so. Can I just say I love everything about this outfit? This is sort of how I want to look every day. Love it. I just got my first few Everlane items and am head over heels for them, and just placed a second order for a ton more pieces from them. So excited! happy new year. that bag looks great on you. Happy new year! You got the bag in bordeaux! It looks great and such a nice accent on the black and white. thank you dear - it's a cheery color indeed! so intrigued by your necklace - it looks amazing on you and perfect with the outfit! Would you consider doing a post on it (on the blog or instagram - i follow both ^_^ ) with a closeup photo? I'm dying to see it in more detail!